In April 2018 RAG will return to London and to the spectacular auditorium at BT’s headquarters, which was also home to popular RAG conferences in 2016 and 2017. 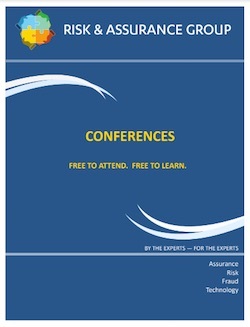 Like all RAG conferences, telcos and regulators can come for free! The conference will be held over two consecutive days, Tuesday 24th and Wednesday 25th April. The main agenda will comprise presentations and panel discussions about modern telecoms risk management and business assurance, including: revenue assurance; fraud management; margin assurance; analytics; data protection; security; and credit risk. Attendees can register for both days or just select the day of most interest to them. Day one will concentrate more on assurance, audit and analytics whilst day two will spend more time on fraud, security and compliance. In addition to the main agenda, the conference will also include several deep dive sessions for small groups interested in obtaining a detailed understanding of a specific topic. Deep dives will be limited to 10 participants per session, and they will be held in parallel to the main agenda. The sessions are described below. Unlike other conferences we avoid promising speakers until we are confident they will take part, so we share the draft of our agendas as we keep adding new speakers to it. The draft agenda can be seen below. Click the speaker’s name to review his or her profile, or else see the profiles of all the confirmed speakers by looking here. Some of the agenda highlights are as follows. Conference host Bernice DeMarco, Director of Revenue Assurance at BT Group, will provide the opening keynote presentation. Tony Sani, MTN executive with responsibility for RAFM across their group, and Michael Lazarou of MTN Cyprus, the guru of online education for RAFM professionals, will provide an update on the launch of RAG’s own online training program and explain why MTN is supporting it. By popular demand, controls expert Rachel Goodin of Ocado will return to discuss the impact of the General Data Protection Regulation (GDPR) and what businesses should do to comply with it. She will be joined on stage by Nealle Page, who is responsible for Ocado’s payments and fraud systems. Paul Davies of Symbox, formerly an RA manager at several UK telcos, will talk about automating the assurance of processes by creating real-time simulations of activities like billing. Julian Adkins, CFO of Millicom Africa, will give a presentation about how his group manages risks in emerging markets. A high-powered panel will discuss how to ensure revenue assurance holds the attention of executives even after the most lucrative leaks have been stopped. Panellists will include: Glen Winn, Head of Revenue Assurance and Fraud at Virgin Media; Mustafa Ali, Head of Business Assurance at Batelco; Nev Phillips, CTO of Symmetry Solutions; and Joe Villarreal, Product Leader for Openet’s Audits and Controls Solution. The panel moderator will be Stuart Waton of Three. Derek Canfield, VP of Analytics at TEOCO, will fly in from the USA to give a presentation. A special session will cover some of the ways that telcos and other professionals have recently helped our community by donating their intellectual property. Award-winning consultant Geoff Ibbett will unveil the standard RA risk model he has created in collaboration with telcos around the world. He will then discuss how the model has been embedded within the free risk quantification software of A1 Telekom Austria, creating an automated mechanism so telcos can assess the extent to which their business is losing all kinds of revenue leakage. Risk historian Jacinthe Galpin, host of the popular weekly Risktory podcast and formerly a risk manager at Telstra, will close the day in conversation with RAG’s Lee Scargall. Jacinthe and Lee will examine the history of regulatory risk in telecommunications. Mark Broom, Group Director of Fraud Operations at Orange and the Chair of the GSMA Fraud & Security Group, will give the opening keynote presentation on day two. Richard Helliar of ThreatMetrix will give a talk on the subject of digital identities and fraud prevention. The ever-popular Tony Poulos of WeDo will give a presentation about how his business is monitoring online markets like eBay and Craigslist for evidence of point of sale fraud. Our first panel of the day will debate the correct relationship between the security and fraud management functions within the telco, especially in light of the increased frequency of social engineering and data breaches, plus the transition to all-IP networks. The expert panellists will include: Charles Brookson OBE; Richard Peachey of Vodafone; Arnd Baranowski, CEO of Oculeus; Jason Lane-Sellers, President of the Communications Fraud Control Association; and fraud consultant David Morrow. Ģirts Kaimiņš, Fraud Prevention and Security Manager at Tele2 Latvia, and Lara Verlinden of SIGOS will discuss why refiling is happening more often in the European Union. They will draw upon empirical data collected from tests that SIGOS has performed on behalf of their customers. The second expert panel will review which frauds are becoming increasingly common and the extent to which improved anti-fraud techniques have mitigated other fraud threats. The participants will include: Nixon Wampamba, General Manager at MTN Group’s RAFM Centre of Excellence; Vincent Revol, Deputy General Manager at FraudBuster; John Haraburda, Principal Solutions Engineer Director at iconectiv; and the panel will be moderated by RAG’s Luke Taylor. Many parties have asked that RAG dedicate a panel to the challenges of performing revenue assurance and fraud management for smaller telcos. We have listened, with a special panel that includes: Kathryn Garland, Fraud & Revenue Assurance Manager at JT Group; Peter Quarmby, RA & Reference Data Manager for Tesco Mobile; and Xavier Lesage, President of Araxxe. RAG Steering Committee member John Preston will moderate. Adrian Harris of Neural Technologies will talk about the use of descriptive analytics as an important element of validating simbox fraud. The conference will close with our regular ‘Wise Heads’ panel, who will review the key takeaways from the event and comment on the state of the industry. On the panel there will be: David Smith, RA pioneer and formerly a Director of the Global Billing Association; regular RAG contributor and industry veteran Andy Harper of Cartesian; and Hayley Daniels, Senior Risk Management Consultant at Neural Technologies and previously a member of the leadership teams at RAG, TUFF and the GSMA Fraud Forum. The moderator will be Eric Priezkalns, Editor of Commsrisk. The deep dive sessions will allow small groups of up to ten participants to concentrate on the detail of a particular subject. Deep dives will be held in parallel to the main agenda, in a meeting room next to the main auditorium. Because of the limited capacity, those wanting to participate in a deep dive are advised to arrive early. 11.10am-11.40am, Lee Scargall will give a tour of RAG Jobs, the new jobs board for telecoms risk and assurance professionals. 1.20pm-2.00pm, Rachel Goodin will lead a session on the “Top Operational Impacts of the EU’s General Data Protection Regulation”. 3.40pm-4.20pm, Michael Lazarou will give a live demonstration of the RAG online training course. 11.10am-12.25pm, Marcus Bryant will lead a round table discussion on how utilities could develop a common assurance framework. 1.25pm-2.15pm, Arnd Baranowski will talk about “New Ways to Prevent PBX Hacking”. 3.20pm-4.00pm, Geoff Ibbett will walk participants through the new RAG RA Risk Map and Catalogue. 4.00pm-4.40pm, Kostadin Taneski of A1 Telekom Austria will remotely dial in (with the help of Geoff Ibbett) to demonstrate how to install and use the free open source software he has developed to automatically evaluate the risk of revenue and cost leakages. The conference will be held in a stunning 170-seat auditorium. There is a dedicated breakout area alongside, with convenient cloakroom and toilet facilities. Photographs of the auditorium can be found here. BT Centre can easily be reached using the London Underground; it is a very short walk from St. Paul’s Tube Station. The following map shows BT Centre (as marked by the BT logo) along with some nearby hotels and other places of interest. You may need to scroll around or zoom out to find some of the suggested hotels. As well as providing lunch and refreshments during each day, attendees are also welcome to join us for a free buffet on both evenings. On the evening of 24th April, RAG will have exclusive use of the Terrace Gallery and adjoining gardens at the Museum of London, just a short walk from BT Centre. The evening event will include the presentation of Lifetime Achievement awards by Risk Reward Awards. The evening of 25th April will see RAG decamp to The Saint, a popular restaurant and bar within sight of St. Paul’s Cathedral. We know some managers want to see a printed brochure before they will approve the cost of travel to our free conferences. Here is a printable PDF brochure for RAG London. You can click the link to download or simply view it below. Managers and staff employed by telcos and regulators will be able to attend RAG London for free by registering in advance using the official email address of their employer. RAG will reject registrations for free seats that come from individuals who are not employed by a telco or a regulator, or who use an email address not associated with the organisation they work for. We may permanently ban individuals who provide false information when registering. Click here if you work for a telco or regulator and want to register for RAG London. Sponsoring businesses may also send their representatives to RAG London. RAG receives ongoing support from several market-leading suppliers, but there are opportunities to sponsor individual conferences. If your business is interested in participating in RAG London then please make your initial query through our contact form. RAG allocates a limited number of complimentary seats for freelance consultants, subject matter experts, and other industry leaders. To ensure we maintain the right balance for RAG London, these seats will only be made available by invitation to specific named individuals. Guest list invitations to RAG London will be emailed in due course. The best way to be added to the guest list is by making a direct enquiry to a member of the RAG Committee or to relevant contacts working for our hosts, BT, or one of the event sponsors. One of the most important aspects of our conferences is what we call the ‘RAG Spirit’. We want attendees to feel relaxed and have the freedom to talk openly about the challenges they face. To protect the RAG Spirit, we aim for balanced audiences of reputable professionals with a relevant interest. We also keep sales talk to a minimum, so we can focus on ideas rather than products. With that in mind, RAG reserves the right to decide who may attend on a case-by-case basis. RAG is a not-for-profit enterprise, and telcos and regulators may attend our events for free, as do many specially invited experts. That means we rely on the generosity of the businesses that host our meetings and pay for everything from our web server to the sandwiches we serve our guests. We would like to thank the following businesses for the contributions that have made it possible to run RAG London 2018. If you would like to be the host of a future RAG event or if you are interested in sponsorship opportunities then please get in touch. We will be glad to hear from you!